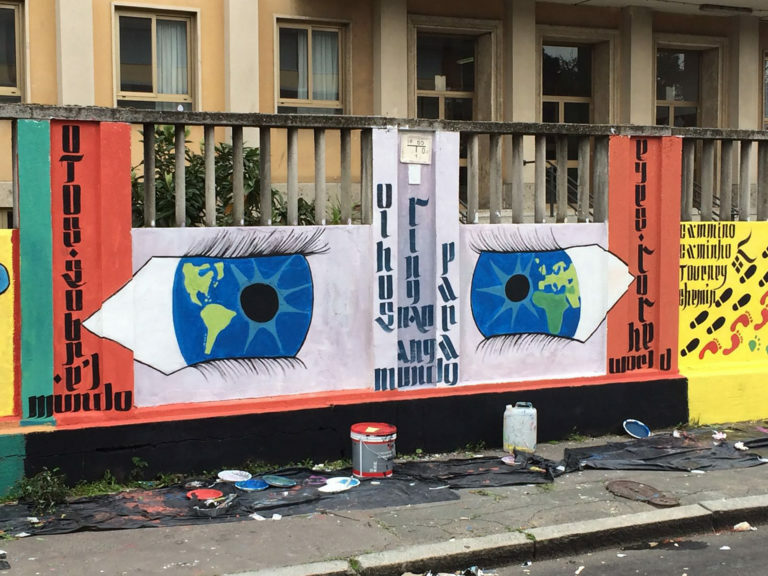 Through a public art initiative in close co-operation with local artists, young people and teenagers from some Milanese schools are helping fight urban decay in the city areas that are usually degraded and vandalized with often offensive slogans and drawings. Project objectives: to regenerate degraded urban areas with the involvement of the whole community, from the city’s authorities to the neighbourhood youth and their parents. Only through awareness raising and education to lawfulness and respect for common property can this result be achieved. Throughout Milan’s area, especially in the outskirts, urban and environmental decay is often represented by buildings dirtied by graffiti and obscene drawings. These situations reflect several problems affecting the city’s suburban areas: from social disintegration to the shortage or complete lack of public spaces and services. A certain feeling of disregard for the surrounding environment still predominates in these situations; this creates urban pockets where the sense of lawfulness is becoming increasingly more blurred. Scribbling on walls is a sign of bad manners and lack of respect for others and for common property. 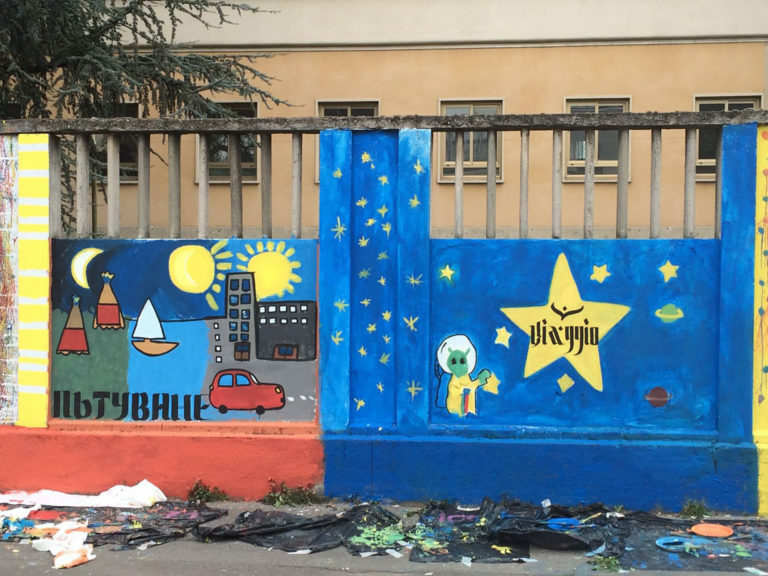 Among the many possible examples of this Milanese cross-section, one in particular is the long wall surrounding the Istituto Comprensivo Narcisi, located in the south-western district of Lorenteggio, which gets regularly vandalized by writers and graffiti artists who dirty its panels with vulgar writings and sketches. This represents a lack of respect for common property that conveys anger, degradation and neglect of the place. The area in question comprises urban buildings housing 13,332 people, most of whom came to Milan from the southern regions during the Sixties. Recently there has however been a constant growth in the percentage of foreign citizens. A long, grey wall looks sad, a messed-up wall encourages further dirtying. On the other hand, a beautiful drawing on a wall is respected. 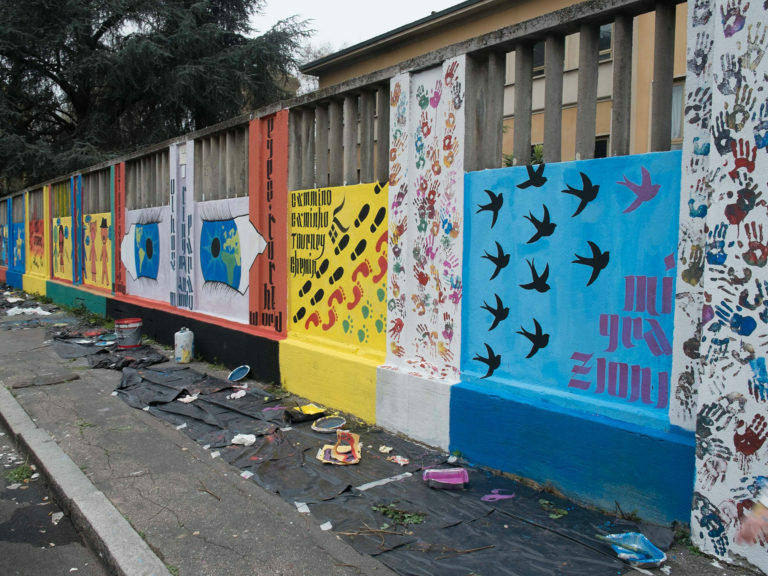 Just inside the Lorenteggio district, in co-operation with the Parents’ Association, the management of Istituto Narcisi and the Council of the 6th Municipal district of Milan, CELIM has promoted an initiative that, during the month of September 2016, involved some local students in the upgrading of the boundary wall of the school complex. 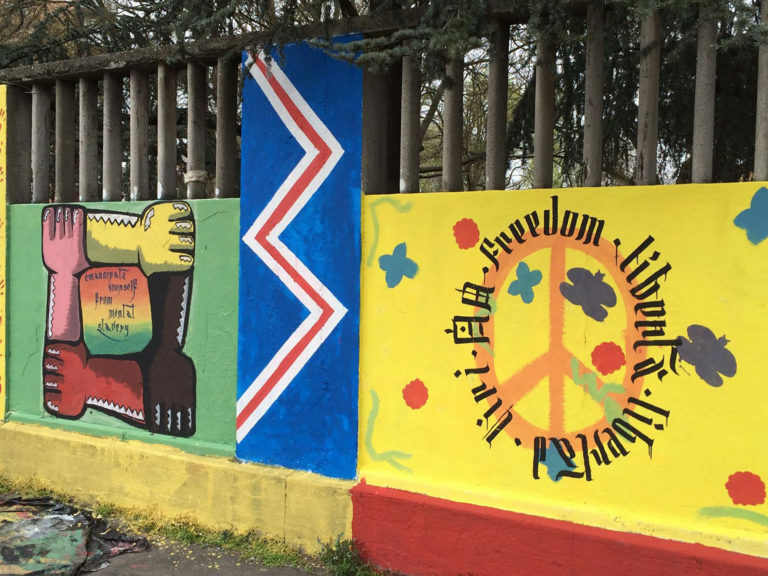 Coordinated by the artist Ivan Tresoldi and other collaborators from Artkademy, 40 youths aged between 10 and 18 actively took part in the urban and environmental redevelopment of the area, recovering the wall surrounding the building of the Narcisi school from its state of degradation and decorating it with peace- and multiculturalism-themed designs. 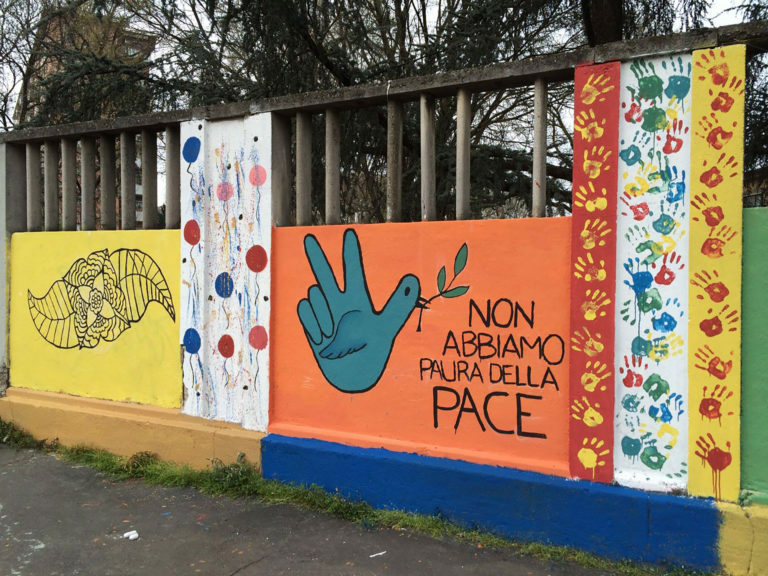 To achieve this goal, the students interested in the project were taken to a summer training campus, where they took part in a wall-painting workshop. No matter how seemingly small, the result achieved by the young people of the area’s schools through the artistic redevelopment of the long wall represented a practical action leading on to other much broader goals in the area. Among these the participants’ personal growth, the promotion of an education devoted to mutual respect and an increase of what we call active citizenship, that is the involvement of the local community in collaboration with local institutions. The Campus takes place during holiday times throughout the year. Even a small gesture, such as making a wall more attractive by repainting it, can help lay the foundations for a more structured social change. My name is Silvia Jelmini and I have been working with the students of Milan's schools for twenty years. By actively involving the young people and communities of the area, the project’s objective is the aesthetic, environmental and social redevelopment of areas usually affected by decay, which too often is a distinctive mark of the city’s more suburban areas. 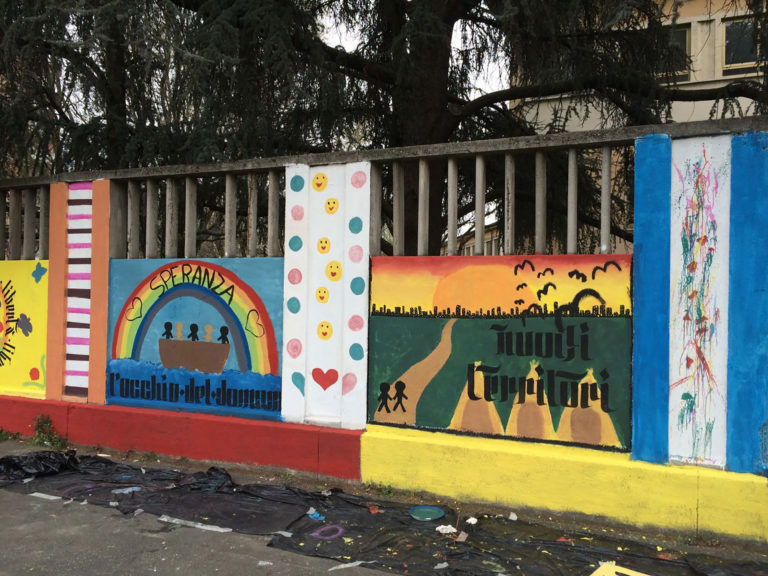 To achieve this result the city’s institutions and the family members of the students of local schools, as well as the whole community, are involved by promoting the real importance of general participation in the environmental protection of the outskirts of Milan. With a total duration of 30 days, the project also includes a preliminary stage of education and awareness raising of the pupils, young people and teenagers involved in the initiative. The participants are also accompanied throughout their journey by local artists who, by offering their creativity and their passion, transmit these values to the boys and to the interested communities.